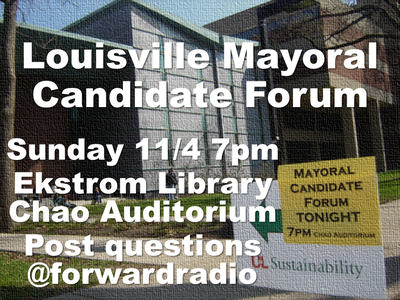 UofL's Sustainability Council is partnering with Louisville's grassroots community radio station, FORward Radio 106.5fm, to host and live-broadcast a moderated public forum for all registered candidates for Louisville's next Mayor. This will not be a typical candidate debate with antagonistic posturing designed to generate 30-second sound bites. Rather, we will host a different kind of candidate forum, one expressly designed to stimulate, inform and uplift, rather than exhaust, confound and deflate. All registered candidates for Louisville Mayor have been invited to attend. American Party candidate, Billy Ralls, and all six Independent candidates have confirmed their participation: Chris Thieneman, Jackie Green, Isaac Marion Thacker IV, Sean Vandevander, Henry Owens III, and Douglas Edward Lattimore. The Forum will be a free, ticket-less event with seating available on a first-come, first-served basis. You can help shape this forum by sharing with us the questions that you want to ask of all our Mayoral Candidates on Twitter @forwardradio.